Season halibut steaks on both sides with 1 tablespoon olive oil and salt and pepper. Set aside. In a medium sauce pan add water and salt (enough to taste like sea water – taste it!) to boil. Add fingerling potatoes, cover and steam 10 minutes or until ½ way cooked. Strain. Add 1 tablespoon olive oil and harissa paste to pan, toss to combine. Pour potatoes onto baking sheet and roast 10-15 minutes. Remove from oven and keep warm. Place asparagus spears on a small baking sheet, add 1 tablespoon olive and 1 teaspoon salt. Toss to coat. Roast 10-15 minutes. Remove from oven. In a medium sauce pan combine wine, shallot, thyme, peppercorn and bay leaf. Cook over medium heat until liquid is reduced by half. Add water, lobster base, heavy cream and saffron. Reduce heat to medium low or a slow gentle boil and reduce liquid to 1- 1/12 cups creamy, silky lobster sauce. This will take about 30 about minutes. Strain, saving liquid. Pour liquid into small saucepan and add butter and swirl to combine. Taste. Add salt and pepper if needed. In a large ovenproof frying pan over medium high heat add canola oil and heat until shimmery. Place seasoned halibut in hot pan. Sear on one side for 2 minutes. Once halibut has a solid sear flip fish and sear for 10 seconds. Place pan in oven and cook halibut for 6-8 minutes or until desired doneness. To serve place roasted harissa fingerlings on center of plate. 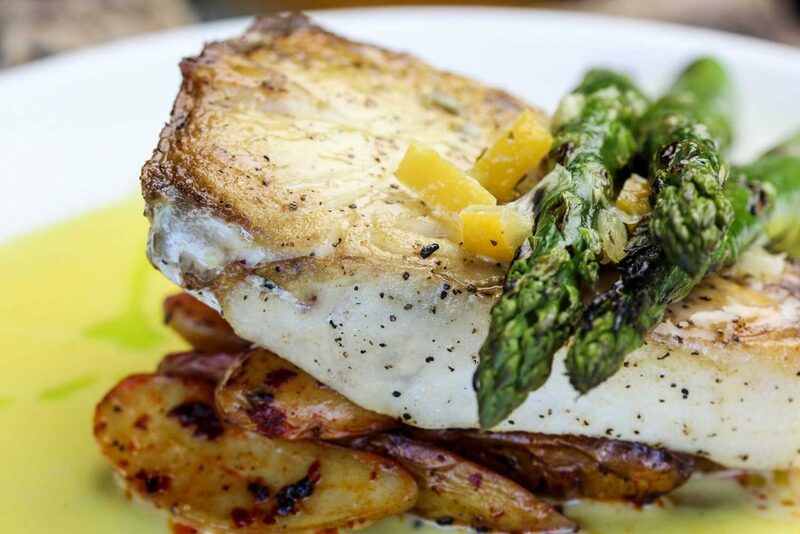 Place halibut on top of potatoes and place asparagus on top of halibut. Spoon lobster saffron cream around plate and drizzle on top of asparagus.